LVLten is a bi-monthly publication geared towards young performers of every genre (acting, modeling, dance and music). 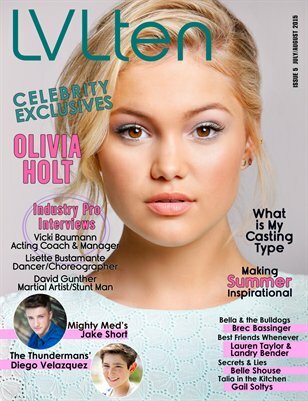 Our July/August 2015 issue contains exclusive celebrity features (fashion editorials with exclusive interviews) with Disney’s I Didn’t Do It actress Olivia Holt, Disney XD Mighty Med Star Jake Short, Nickelodeon’s Bella and the Bulldogs’ Brec Bassinger, The Thundermans’ Diego Velazquez, Disney Channel’s Best Friends Whenever stars Landry Bender and Lauren Taylor, Secrets & Lies actress Belle Shouse, Talia in the Kitchen’s Gail Soltys and Insidious: Chapter 3 star Tate Berney. Exclusive Industry PRO interviews with Celebrity Acting Coach and Manager, Vicki Baumann, Dancer/Choreographer Lisette Bustamante and Martial Artist / Stunt Man David Gunther PLUS articles on Making Summer Inspirational and What Is My Casting Type. LVLten (level ten): Giving it your ALL with nothing held back. LOVE level ten. DREAM level ten. And pursue your PASSIONS level ten.